Estate Gate Cast Iron. This set really makes a statement for an entrance. 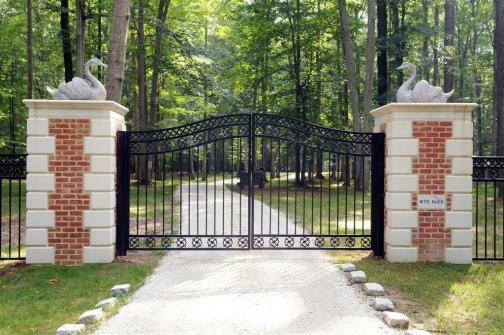 You can see below we did a project on a 1200 acre estate..the customer had us design and fabricate the gate and fencing section for his entrance. On this particular project the customer decided to have brick clad columns instead of marble. Measures: 7 feet high x 12 feet wide. Before purchasing please contact us for availability, color options and for a shipping quote 410-745-3700.